Ask us about off-season and long-term discounts. Our spotlessly clean, perfectly located, beautifully furnished and fully renovated single- family townhouse in Provence is available for short or long-term rentals. You will have the property to yourselves. It is not an apartment or condo. Free hi-speed Wi-Fi. All modern appliances. Perfectly located for the AVIGNON INTERNATIONAL THEATER FESTIVAL in July. Or for exploring the Roman sites, the wineries and the villages of Provence at any time of year. 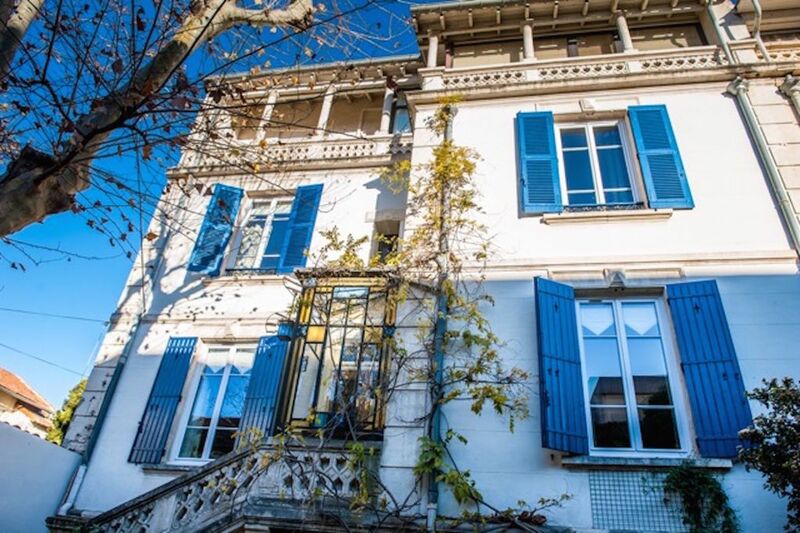 The house is on a quiet street, just steps from Avignon's bustling center and famous 14th Century walls. Bakeries, food and wine shops, the central post office and train station, a fantastic "art" cinema, numerous banks, schools, the university and even the Avignon Opera and the historic Papal Palace (to say nothing of the famous "pont" of "Sur le pont d'Avignon..." fame) are all within easy walking distance. The neighbors are friendly and helpful. The tinkling fountain adds a relaxing note to the shaded courtyard during the warm summer months. And there is FREE SECURE PARKING, a big plus for travelers who'll be renting a car, and an amenity not available at most rental properties within the town walls. We love the fact that our house faces south and is bathed on all three levels with warm, natural light. Ceilings are high, windows are tall. The fully-equipped, open kitchen has custom cabinets, a 5-burner range, a dishwasher and an American-style refrigerator with ice maker and filtered water dispenser. Most of the furniture and light fixtures are Art Deco style from the 1930's. NOTHING from IKEA! Mattresses, linens and towels are all virtually new. Two of the bedrooms have full-sized beds; one has 2 twin beds. One of the bedrooms has air conditioning. On the second floor there is a large bath with claw foot tub, pedestal sink and shower. The toilet is separate. On the third floor there is a smaller full bath with shower. And in the basement there is a third toilet near the washer and dryer. Washer, dryer and and small "summer kitchen" are in the basement with direct access to the courtyard. The shady courtyard has tables, chairs and a small fountain that runs in the summer and fall, adding a romantic touch to outdoor meals. We lived in Avignon from 2011 to 2017 so our children could learn another culture and another language, loving every minute. Then we returned to the US for the twins' final years of high school. Woody is a retired school administrator; Pauline, a doctor and writer. We chose Avignon for its sunny climate, rich cultural opportunities and convenient location. The Marseille airport is just an hour away by car or train. Paris only about 4 hours by fast train. All the famous attractions of Provence are easily accessible by car. And we chose the house for its old world charm, its warm and welcoming spirit, its natural light and its perfect location. Walk to everything in Avignon! Restaurants, markets, museums, theaters, art cinema and shopping. To say nothing of the Papal Palace and the Pont d'Avignon. And all the wineries and tourist attractions of Provence are within a short drive. Quiet residential neighborhood, walking distance to everything. In guest bedroom only. Fans provided for other rooms. Yes, efficient front loading machine. Yes; but we prefer that guests not use it. "American" refrigerator with big freezer, ice maker and filtered water dispenser. Guests are welcome to use and replace any staples. Small selection of jazz and classical. Lots of classic and international DVD's. Rentals available at the Pont du Gard, a UNESCO site and must-see marvel of ancient Roman engineering. Provided by the city of Avignon. Private patio in front of the house with table, chairs, umbrella and tinkling fountain. Smoking is allowed in the courtyard only. Lovely and well loved home just outside the walls of Avignon center - very welcoming and well appointed. Beautiful architecture inside and out; house is furnished with antiques authentic to the history of the house. Hosts were so helpful and kind throughout the process; wonderful location and quiet neighborhood. Would stay again without a second thought. Townhouse was large and fit our family well. Nice kitchen and dining area. Air conditioning unit in one bedroom only, so very hot in rest of the house. Did not care for location. Washer and dryer handy. We are so sorry you did not like our in-town location. Our other guests have all loved it, as do we, since we appreciate being able to walk to everything! We're glad your stay went well all the same, and we thank you for leaving the house in such good shape. This was the perfect spot for our moms' trip away from home. The home is so beautiful, and comfortably slept all 5 of us. It is a perfect location - quiet yet close to town. The handbook with restaurant recommendations was so helpful as well. Once we arrived we received an email from Woody making sure all went well. It did, it was simply perfect. Highly, highly recommend this house. Since our return we have all said how the house was part of the great experience of Avignon! We're so glad you enjoyed your stay and hope you'll come back next year. perhaps try one of our other houses listed on VRBO! They're numbers 410885 and 619920. Spacious beautiful home with character ! We stayed here with 3 adults and our 3 year old boy and it was exactly what we needed! We could feel the history of the city in the architecture of the townhouse, and everything one would need for a visit was there. It was a short walk to all the tourist sites and restaurants in the city, where we spent a full day. We used the home as base to visit Pont Du Gard ( a breathtaking must do, and definitely swim in the river afterward as we had a grand time doing so) and for a wine tasting trip up the Rhone valley. The home also has a garage which proved extremely convenient. The visitor's guide book made by the owners was extraordinarily comprehensive and had a comforting personal touch. Finally, we booked the home at the last minute within 2 days of arriving and everything went perfectly. The owners were extremely responsive and kind over email - it felt like we were being hosted rather than simply renting a room. PS- if you stay here , follow the restaurant advice in the book, stay away from the big outdoor restaurants in the plazas, and make reservations. We had a particularly great experience at Fou de FaFa and would highly recommend. Thanks for those kind words. We're so glad our recommendations helped make your stay memorable. We hope you can return next year! Our experience at the Avignon house was much more akin to staying at a good friend's home than a commercial rental transaction. Woody sent us periodic updates about the parking and road work situation around the house beforehand, and checked in with us via email after we arrived. The caretaker came by twice to look in on us and make sure we had no problems. The kitchen was stocked with everything we needed, including a welcoming bottle of rose. I felt like a long-lost cousin being welcomed back into the family. The house itself is roomy in the kitchen and dining room for gatherings, and cozy in the living room which is now well supplied with lounging furniture. Bedrooms are spacious and thoughtfully equipped with fans and mosquito netting (the surrounding area are wetlands), which came in handy during our Summer nights. The house booklet had detailed but not laborious instructions, and the dining recommendations were spot-on - far better than our guidebooks. There are a couple great bakeries and small grocers a few steps away, and the bartender at the nearby Bar Du Progress, where we visited every morning for entirely passable cappuccinos (the French just can't help but burn their coffee! ), clasped our hands when we told him we were leaving. We visited Avignon during the Festival, and inside the wall was a nearly in-navigable mass of people. Festive, to be sure, but a bit wearying. It was really nice to slip just outside the wall to this quiet, comfortable getaway. I can't recommend this stay enough. Wow! This was a perfect location for our two week stay in Provence. A comfortable home from which to launch on our daily excursions. A two block walk takes you inside the walls of this beautiful medieval town. I'm reviewing the house, so I'll skip Avignon itself, but trust me, it is worth several days of wandering and exploration. The house itself is comfortable and charming. Stairs are part of the deal, so plan on going upstairs for bedroom and bathroom. The main floor has a spacious modern kitchen and a large dining table. When our group of six people wanted to eat in it was easy. The other room on the main floor is a modest size living room which would be perfect with some more comfortable furniture. The bedrooms and beds are comfortable and airy; high ceilings add to the charm. Pauline and Woody have made life easy for visitors with an extensive manual that covers everything about the house as well as shopping, restaurants and more. Because we had a car we were able to explore towns and sights in all directions, and the manual covered those options as well. Avignon's central location is perfect for those excursions and of course it helps that the airport in Marseille is less than an hour from the house. In retrospect this home and its location made for one of our best family vacations ever. We recommend it highly. Thanks, Steve. We're so glad you enjoyed your stay. We'd heard from other guests about the living room furniture, so have already added two cozy chairs and rearranged the furniture to make watching TV or movies comfortable and easy. Avignon is in the heart of Provence and the Côtes du Rhone wine region. It is most famous for the Palace of the Popes and the summer theater festival; but offers restaurants, museums, art movies, hikes, antiquing and concerts (including Opera) year-round. St. Remy de Provence, Les Baux, Arles and the Camargue beaches and bird preserve are all nearby to the south. The Roman theater in Orange is an easy drive to the north, as are Chateauneuf du Pape, Vaison la Romaine, Fontaine de Vaucluse and well-known wine towns such as Seguret and Rasteau. The incredible Roman aqueduct, the Pont du Gard, is just across the river to the east, as is our favorite family run winery. Deposit is not refundable in case of cancellation. Rent is refundable only if booking is canceled more than 60 days prior to the beginning of the stay.